Vision Team Retreat on Saturday! Rev. 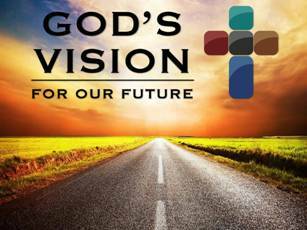 Roger Ross, Director of Congregational Excellence for the Missouri Conference, will be leading our EUMC Vision Team and our church staff through a visioning process this Saturday. We invite you to pray for this team as they begin this amazing journey of discerning God's unique vision for Eureka UMC! We are adding another worship service on Easter! 9:45 am Easter "Family" Service Live Stream: Our 9:45 am service will be streaming live through our Facebook page via Facebook Live. If you will be travelling, be sure to join us online and 'comment' where you are joining us from! *We encourage families that normally attend the 9:45 am service to consider attending the 7:00 am Easter Sunrise "Family" Service on April 1st. This will provide additional space for our new families and guests to join us at the 9:45 am service. Also, please consider attending the 7:00 am service and serving at the 9:45 am service. Who will you invite to one of our THREE EASTER SERVICES? 8 out of 10 people will say yes if you invite them to an Easter Service! We will have Easter invite cards available at the Welcome Desk beginning this Sunday. If you knew that you had just one week left to live, how would that shape your actions? How would you spend your time? With whom would you spend your time? 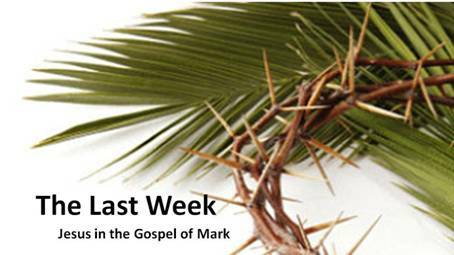 We will be exploring The Last Week of Jesus' life during Lent. We will look closely at his actions, where he went, and with whom he spent time with. We will consider what all of this meant 2,000 years ago and what it means to us today. The Gospel of Mark will be our guide during this wonderful, day by day journey with Jesus, during this season of Lent. We will continue our Lenten journey this Sunday by exploring the events surrounding the last Friday of Jesus' life with a message titled "The Death of Jesus" from Mark 15:33-47. We offer three worship experiences on Sundays! Our 9:45 am worship service includes modern Christian music led by our amazing praise team. If you are travelling or staying at home with sick children, you can join us online at 9:45 am. This service will be streaming live via our Eureka United Methodist Church Facebook page and Facebook Live. Our 8:30 am worship service includes traditional Christian hymns led by our wonderful choir. Childcare (birth through 2 years old) is available during both worship services. 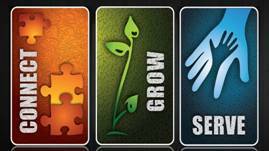 Our XP3 Youth (grades 6-12) meet on the second and fourth Sundays of each month. "MORE" answers the questions: What do you do with envy? This 3 week series explores the teachings of John Wesley on the topic of finances. He teaches us to save more, earn more, and to give more. April 8 "What is the More?" 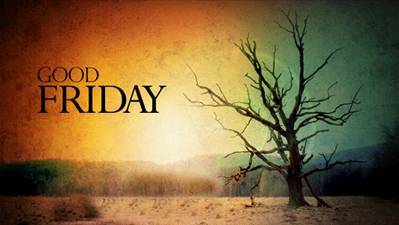 The sanctuary will be open from 6 am until 3 pm on Friday, March 30th for a self guided "Good Friday" experience. opportunity to remember your baptism and 'dying and being raised with Christ'. Calling all men! You are invited to join our Men's Breakfast and Bible Study on Thursday mornings at Denny's in Eureka. We meet from 6:30 am until 7:30 am, enjoy a great breakfast and go deeper into God's Word by exploring the Bible passage that will be part of next Sunday's sermon. Interested? A senior group having fun and enjoying each others company. Join us Tuesday, April 10 at Noon/EUMC commons for a potluck. Bring meat, vegetable, salad or dessert. We’ll have a program presented by Jeanie Myers. Please contact Betty Branscum (636.451.3025) if you are coming and what you’ll be sharing with the group. Hope to see you there! NEW LIFE GROUP FOR 20S & 30S FORMING NOW! We live in a culture that caters to our choices. We like our options, and we enjoy the opportunity to choose our preferences. Popular psychology and human reasoning tell us to make choices based on what feels good. They encourage us, “just follow your heart.” God has given us a much better guide, however, in His Word. Unlike our fickle and untrustworthy opinions, God’s Word never changes. Its dependability has been proven through the centuries. In The Choice Is Yours, Terrie Chappell will lead us through twelve choices that can strengthen or weaken our walk with God. Discover these important, daily decisions that will bring joy and purpose to your life! Dine in or drive up and enjoy dinner at Culver’s, Eureka, and 10% of ALL proceeds will be donated to the Children’s & Youth Ministries of EUMC! YOUTH CATALYST SESSION: For youth, parents of youth, or those interested in working with youth (5-12 grade), join us on Sunday, April 22nd at 11 am for our first Catalyst session. We will meet in the UTX area for a listening and planning session targeted towards our new youth ministry. This will be a time to come together, explore possibilities, invite new ideas, and build excitement towards things to come. We want YOU to be a part of our explosive new youth ministry, please let me know you are coming! Jenny.babb@eurekaumc.org. Thank you, we’ll see you there! We are bringing Dave Ramsey's Financial Peace University to Eureka UMC! Classes will meet Sunday morning @ 11 am in 7th grade classroom, beginning April 8th for a 9 week course. More information and sign up on our website at eurekaumc.org or contact David Babb through the Connections Desk Sunday morning. YOUTH SUMMER MISSION TRIP TO GEORGIA! Cost for this trip is $400, more information on our website or contact Jenny Babb, Director of Family Ministries. Eagle Lake camp - registration is now open for Eagle Lake Camp. The dates are July 23rd Thru the 27th. Receive $20 off for each referral for a family that has not attended camp before! This could potentially be a HUGE savings (i.e. by inviting multiple families) for your campers. More information available on the website. Mini camp - have a little one that is too young for Eagle Lake? Register them for our mini camp! Also running July 23rd through the 27th from 9 a.m. to 1 p.m., for ages 3 to 5. Register online, spots are limited. Start saving your items to donate to our Rummage Sale the week of April 22-28th! Proceeds benefit Youth Mission Trips. Interested in helping with the sale to earn money for youth events? Contact Tina Butler at butler.tina0@gmail.com. Life Line Screening, a leading provider of community-based preventive health screenings will be in our community on Wednesday, May 23, 2018 at Eureka United Methodist Church. Ultrasound screenings to Identify risk factors for Cardiovascular disease include; Carotid Artery (plaque buildup-a leading cause of stroke), Abdominal Aortic Aneurysm (an enlargement or weak area in the main blood vessel that carries blood from the heart to the rest of the body), Peripheral Arterial Disease (hardening of the arteries in the legs), a Heart Rhythm Screening (an EKG to detect Atrial Fibrillation-irregular heartbeat) and an Osteoporosis Risk Assessment for men and women. Being proactive about your health by knowing your risks helps you and your doctor address problems early. we look forward to seeing you on Sunday Morning!